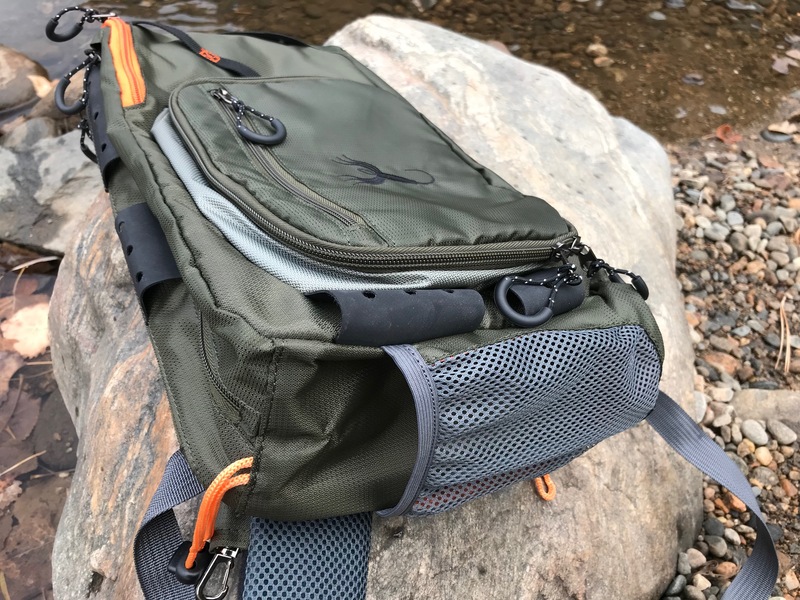 Sling packs have become all the rage in fly fishing over the last few years–and for good reason. 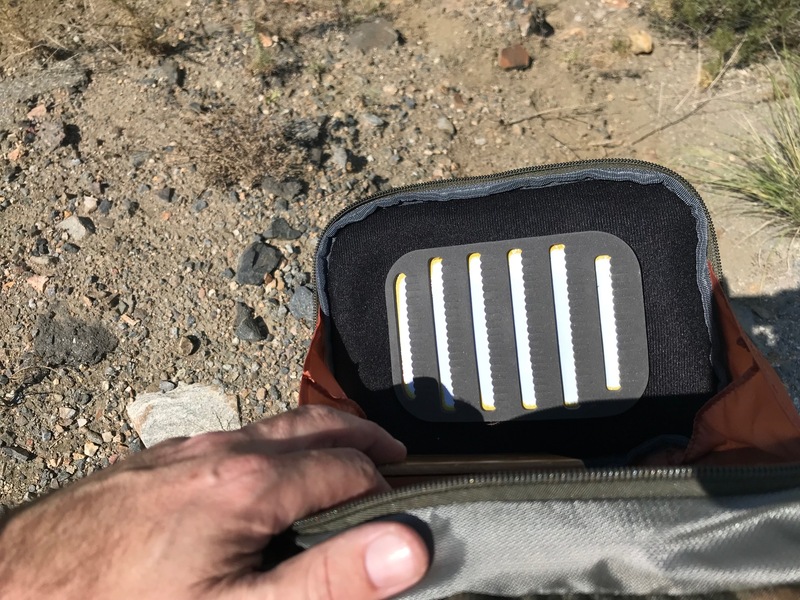 They’re light, compact, versatile, and offer a unique hybrid alternative to wearing both a backpack and a fly fishing vest without sacrificing the convenience and functionality of either. 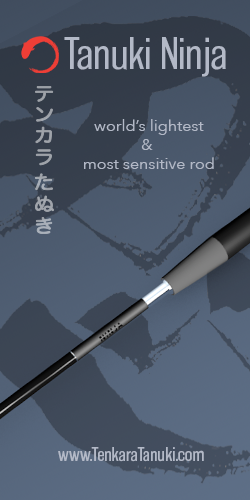 And the intrinsic ethos of their design is especially aligned with the principals and practices of tenkara. 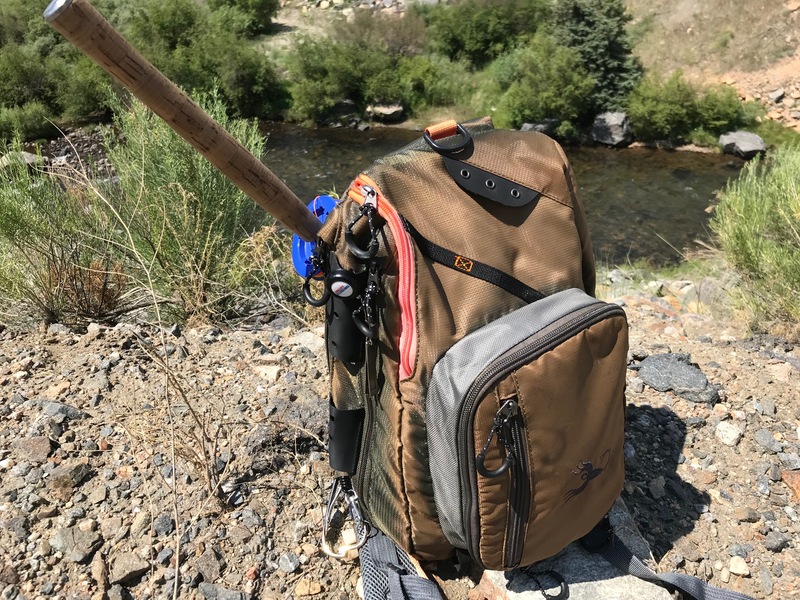 For some time now, I’ve been using the new sling pack from Esoteric Tackle and have been so thoroughly impressed with its performance that I wanted to share some of its features for those on the market for a new on-stream carry system. 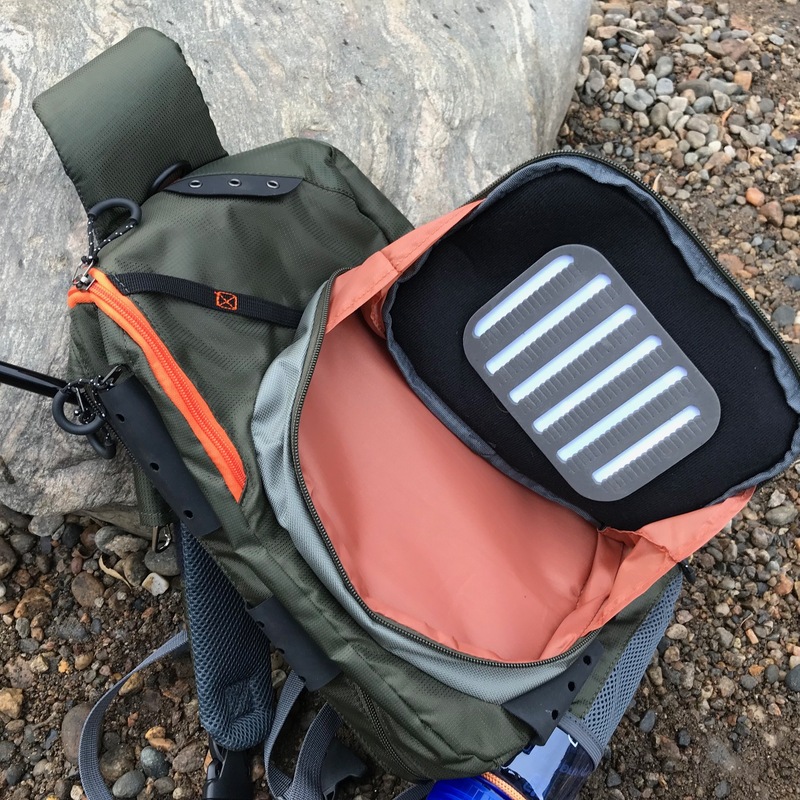 The pack measures 39cm x 26cm x 13cm which in my testing proved to be the perfect size–large enough to carry everything I need for a full day on the water without being bulky or intrusive. It’s constructed of highly durable Cordura fabric that easily shuns scrapes, scuffs, tears, and thorns. You’d be hard pressed to wear this pack out in your lifetime. Yet, despite its robust disposition it’s still lightweight. If there’s one word that I think perfectly summarizes the main virtue of this pack, it’s “organization”. 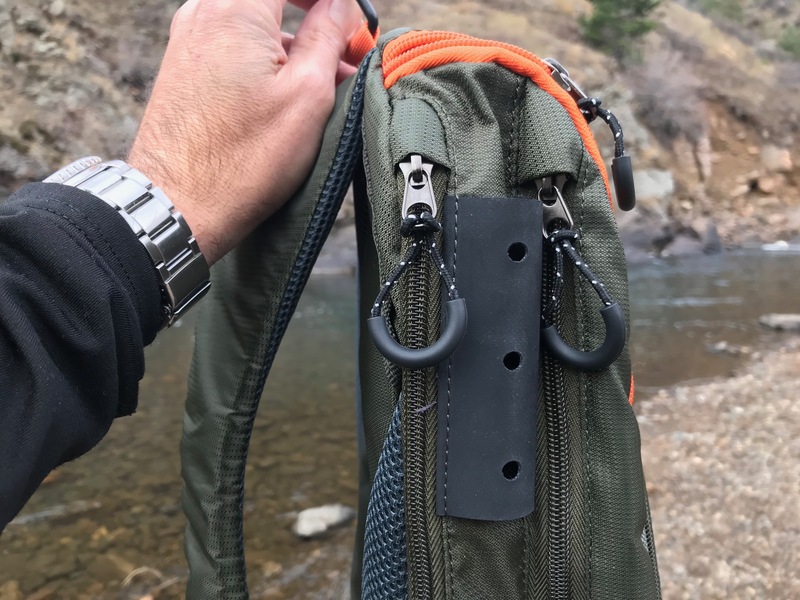 D-rings, grommets, loops, and pockets abound, allowing you to customize your system no matter what type of gear and accessories you carry. And it’s obvious that a lot of thought went into the layout to make everything easily accessible without having to take the pack off. You simply swing the pack around and have instant access to everything inside and out. The main compartment is large enough to hold bulkier items such as rain gear, lunch, extra fly boxes, etc. The secondary pocket is where I keep my fly boxes. It folds out flat to form a “work bench” that is convenient when changing flies or re-rigging. As an added bonus, the inside panel comes with a large, high-density slotted foam patch that would easily hold 100+ flies. Theoretically, if you’re a minimalist angler, you wouldn’t even need to carry any fly boxes at all. Just load up the patch and you’re set for the day. But it’s removable if you don’t want to use it. On the outside flap of the secondary pocket, there’s a slash pocket for thinner or flatter gear. This is where I carry my line spools and thermometer. There’s a slash pocket on top of the pack which is gusseted so this is where I stow more delicate items I don’t want to get crushed like sunglasses or smaller items I don’t want to dig through the main compartment for such as chapstick, lens cloths or multitools. 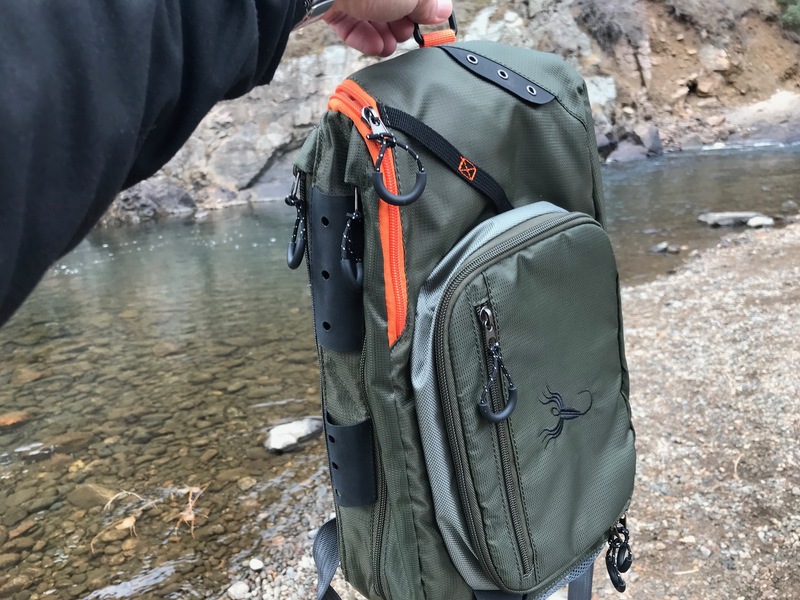 If you like to hang gear on the outside of your pack, you will LOVE this sling. As I mentioned above, there are multiple points of attachment throughout. 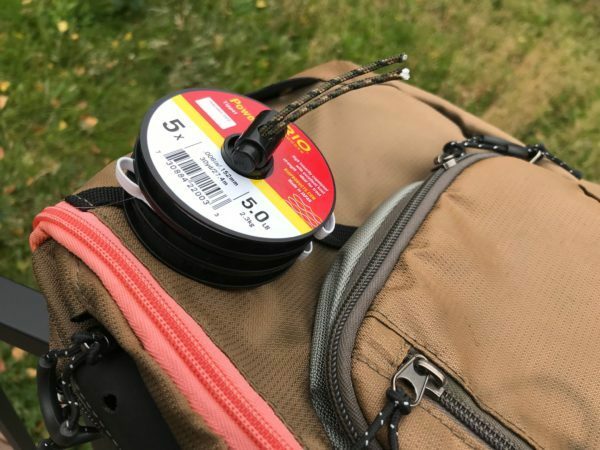 No matter how you want to configure your system, this pack will accommodate with an abundance of thoughtfully placed D-rings, web loops, grommets, and cord loops. One note about the grommets … they’re not just stamped into the fabric (which could wear out quickly). Instead, their ingeniously reinforced with heavy gauge rubber for durability meaning you can easily attach things like zingers without piercing the fabric or worrying about wear and tear from abrasion. 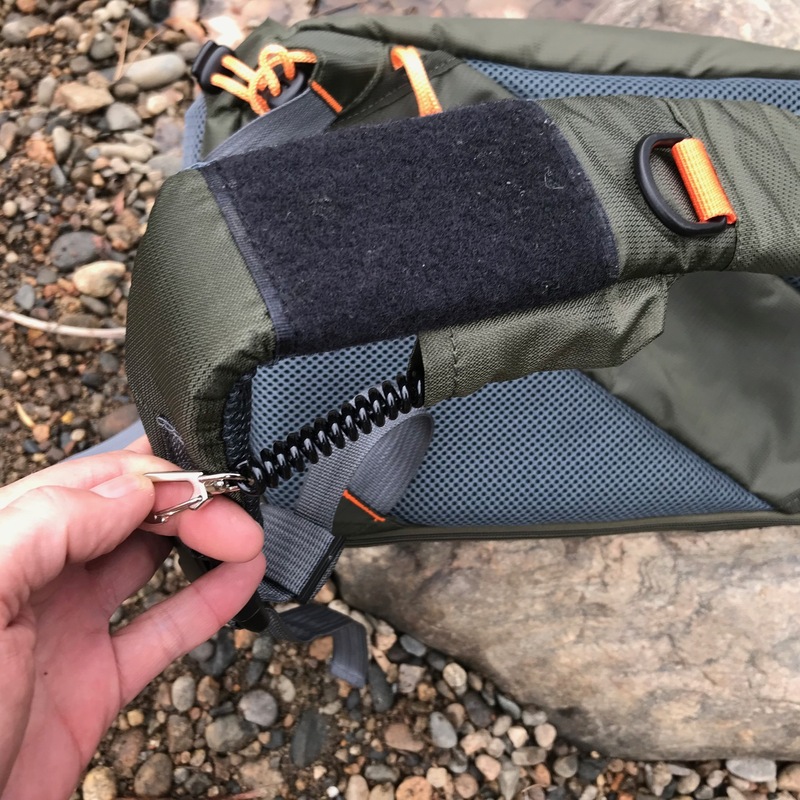 A nice touch is the integrated coil zinger on the shoulder strap with a snap lock for nippers, hemostats, floatant, a thermometer, or anything else you want. There’s also sewn-in Velcro for attaching a fly drying patch. 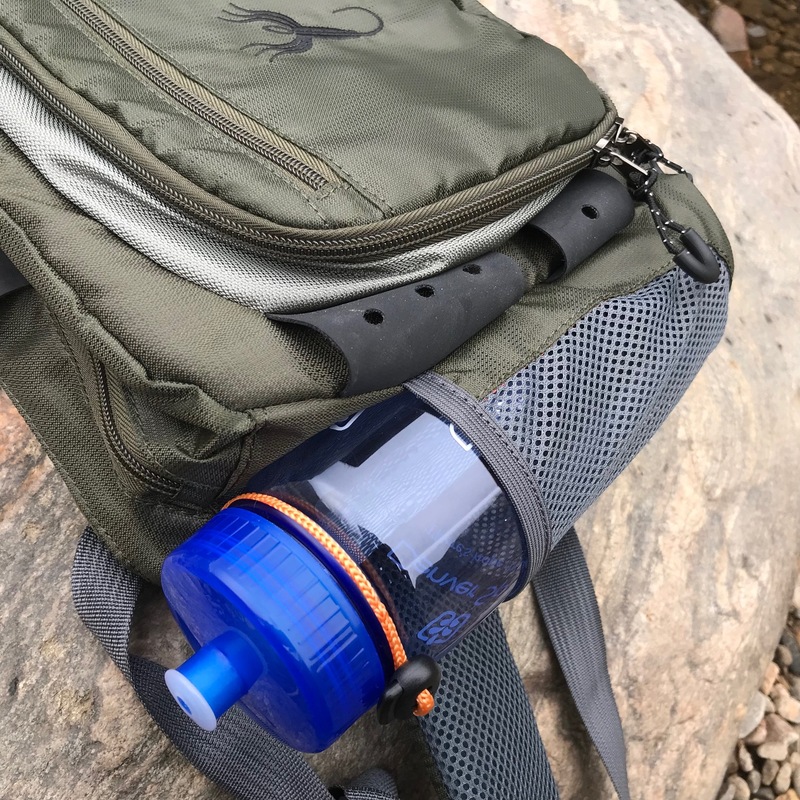 The ingenious water bottle holder sits at the bottom of the pack with an elastic cord and cord lock to prevent your bottle from slipping out. A 32 oz. Nalgene bottle won’t really fit, but it will easily accommodate standard store-bought water bottles and cycling bottles. 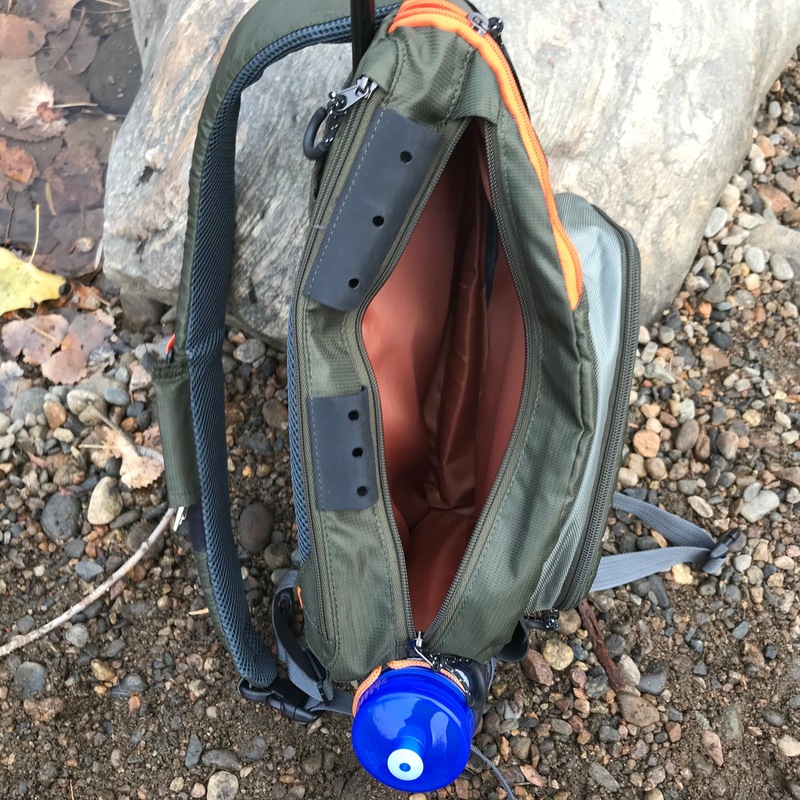 It’s positioned horizontally so you can easily access your water without swinging the pack around or having to take it off. 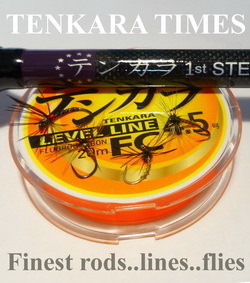 On the back of the pack, there is a “quiver” which will hold up to three tenkara rods. And there are toggled loops at the bottom to secure them so they can’t go AWOL during transport. At first glance, I thought that the rod sleeve against the back of the pack would be uncomfortable. But I was wrong. You cannot even feel the rod when it’s in the quiver so I was pleasantly surprised. And the padded shoulder strap and back panel disperse even the heaviest load evenly and ergonomically. I can wear this pack all day and barley notice it’s there. I also have to give kudos to the design of the zipper pulls. They’re large loops with plastic sleeves to keep them propped open making them a cinch to grab with cold, wet hands or even with gloves on. No struggling to open a pocket here. If you’ve followed me for any length of time, you know that no matter how much I love a product, I have to find at least one thing I’d change about it. After all, no product is 100% perfect. 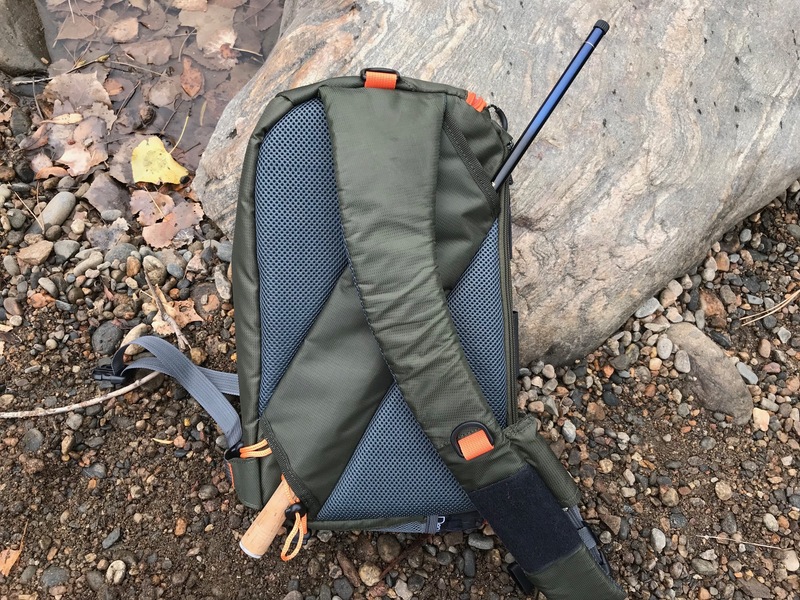 And on the Esoteric Tackle sling pack, I do have one nitpick. The coil zinger tends to get caught on the sleeve that houses it when retracting. This seems to be more of an issue with heavier items like mitten clamps than with lighter accessories such as nippers. It’s a minor inconvenience at worst and could easily be solved with the addition of a rigid plastic or metal rind at the opening of the sleeve to prevent it from collapsing on itself. Like I said, not at all a deal breaker. I’d still drive a Ferrari that had a small scratch on it. Hows does it compare with the Zimmerbuilt sling? I just picked up the Guide Sling and really love it. 1. Organization. This is probably the biggest difference. The Tenkara Guide Sling is pretty bare bones. 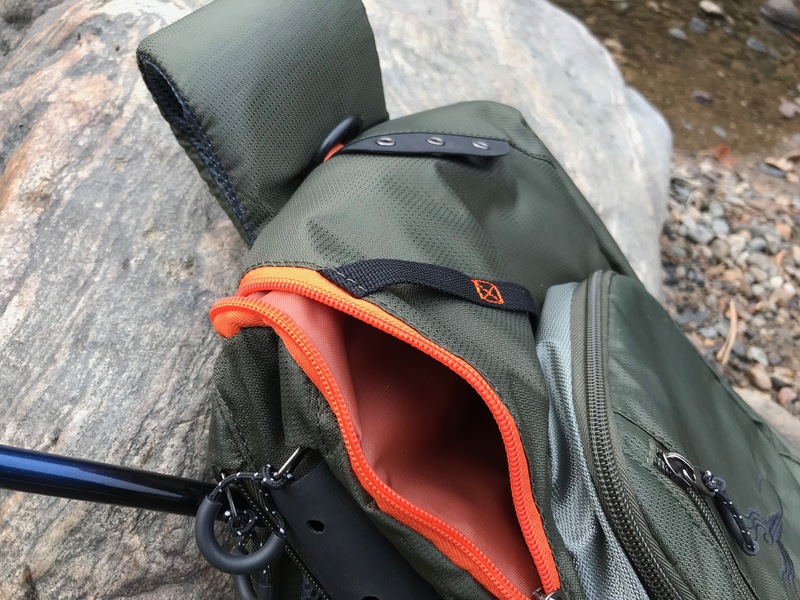 It’s fairly spartan–basically a “sack” with one main compartment, one secondary pocket, and some pockets on the back for storing rods. 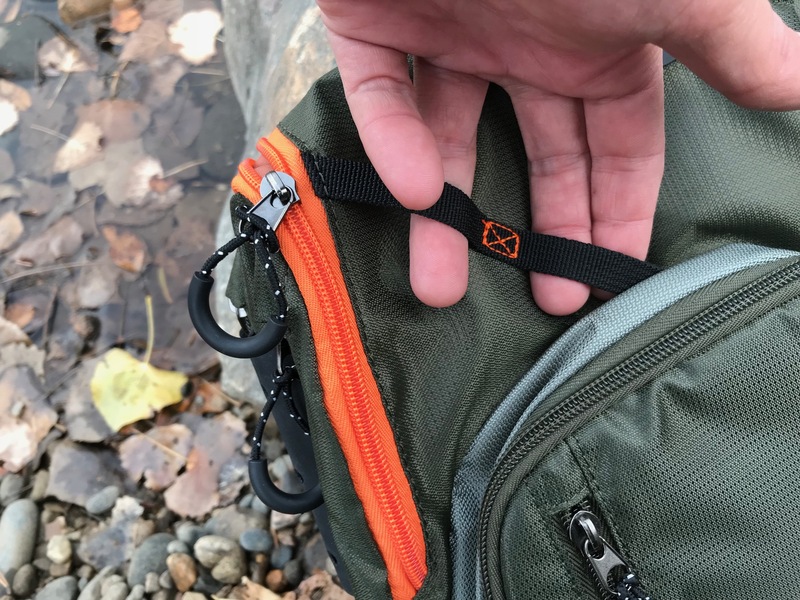 The Esoteric Tackle Sling on the other hand has tons of attachment points, different configuration options double the number of pockets. So if you carry more accessories and need to organize them, the Esoteric Sling would be the way to go. 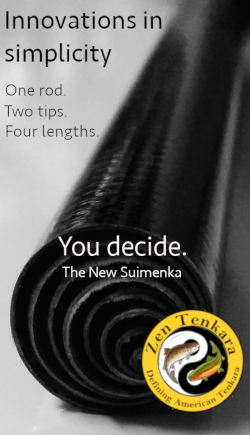 If you’re more of a minimalist, then I would recommend the Tenkara Guide Sling. It’s all a matter of what you carry and how you like to access it. 2. Capacity. 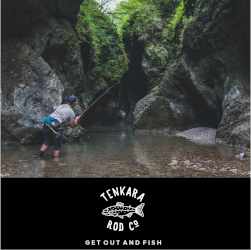 The Tenkara Guide Sling in general has more capacity–especially for bulkier items a guide might carry for client comfort such as extra rain gear, a first-aid kit, extra food, gloves, etc. The Esoteric Sling will carry these things as well, just not as much of it. It’s designed more to better organize smaller accessories. 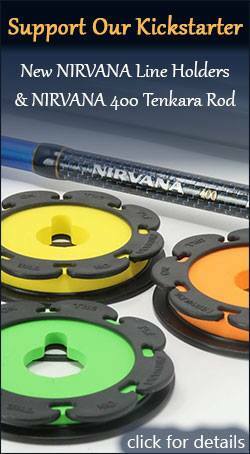 Also, the Tenkara Guide Sling will hold more rods. 3. Weight/Comfort. 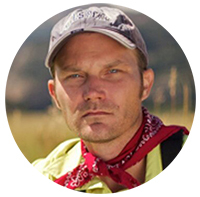 Since the Guide Sling is constructed of a single layer of Dyneema, it’s lighter than the Esoteric Sling. 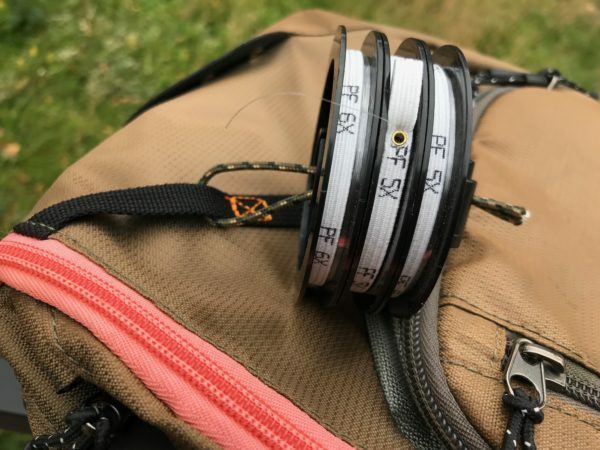 That’s not to say the Esoteric Sling is heavy by any means, but some ultralight fly fishers like to count every gram so the Guide Sling might appeal to them more. 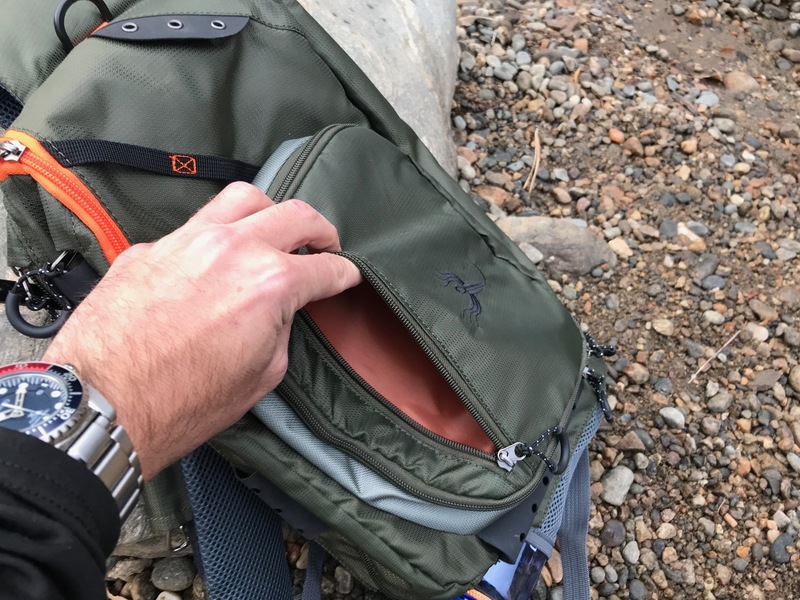 On the flip side, because of that UL construction, the Guide sling doesn’t really have “structure” to it whereas the Esoteric bag is reinforces with more padding like a conventional backpack. It holds it’s shape whether empty or full. Some people prefer this and will find it more comfortable all around. Again, a matter of personal preference. Both are excellent bags and I wouldn’t hesitate to recommend either one. But what I would tell someone before making the decision is to first lay out all of the gear you plan on carrying. Then, decide which pieces of gear you need to access in which situations and imagine what it would be like to do so with each bag. I hope this helps. Feel free to call or email me if you have any other questions. Jason: nice piece. Nice to hear from you. Jason, Your usual sensible approach. Thanks for the thoughts on the new pack. Nice to see you active again. It’s been a bit quiet. Because you have been very busy I hope. I recently purchased this sling pack and I’ve struggled a bit to find a convenient way to store tippet. Right now I’m putting it in the pocket that folds out to be the small worktable. The issue is, it is sitting on top of my fly box and has a tendency to roll out and fall to the ground. If you have any suggestions they would be greatly appreciated! Hi Alex, yes I do. Take a length of paracord and loop it through one of the accessory straps at the top of the pack. 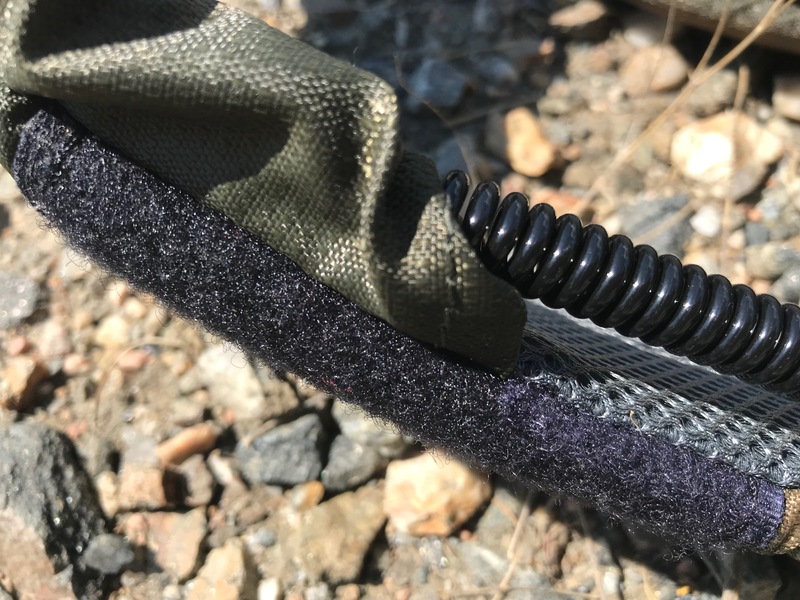 Double it over itself, thread it through your tippet spools and then through a cordlock and cinch it down so it’s fairly tight, but loose enough so the tippet spools will still rotate. 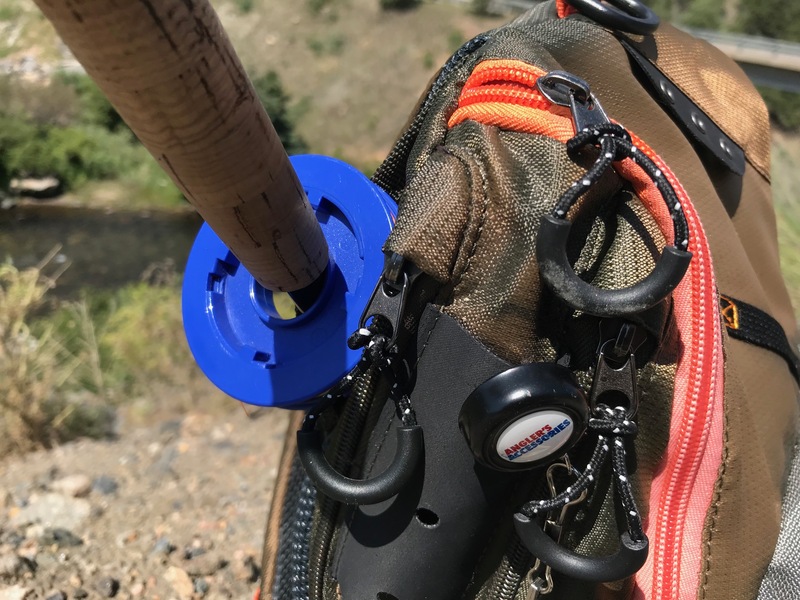 Now you’ve got a convenient tippet dispenser right at your fingertips when you slide the pack around to re-rig. Hope this helps.